Can We Get Low Carb Help From Dietitians? 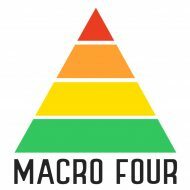 Posted bymacrofour	 February 18, 2017 February 19, 2017 Leave a comment on Can We Get Low Carb Help From Dietitians? Not to re-invent the wheel as Foodmed.net did an in-depth series of articles on the Dietitians Association of Australia (DAA). 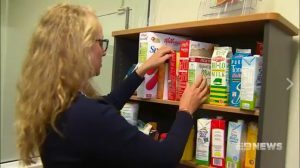 These reports questioned in particular whether food industry sponsorship skewed their advice, whether their spokespeople were in touch and not influenced by industry, how there was likely to be dubious media information from such involvement and how there was apparent suppression of opposing views. The author, Marika Sboros, was not the first investigative journalist to report on the issue of possible industry influence in the DAA. She did not pull punches in suggesting that they engaged in fake news and disclosed that significant amounts of their revenue came from industry sponsorship. The DAA’s only response (that I am aware of) was this statement on their website. What is the reality? Can we trust the DAA and its dietitians in general for their advice? It is an important question for health consumers and not just Australian ones. DAA is part of an international organisation, and they all appear to sing from the same dietary hymn sheet (standards). In our analysis of the paper behind the DAA press release we discovered that the women with PCOS were part of a self-help charity and were probably following a lower carb approach out of the ‘wisdom of the crowds’. That said it did not appear to be a very low carbohydrate diet being on average 42% carbs by energy. The DAA seemed to recommend increased carbohydrate consumption when we found that there was no evidence for that from the cited study. In fact, from reviewing the literature and interpreting the evidence, the advice should be that PCOS sufferers would benefit by reducing carbohydrates starting with sugar. Did not make it clear to a largely uninformed public that this was not an intervention study. In other words, there was no experiment to put equally sick subjects a low carbohydrate diet and evaluate their health improvement. At best it is a small epidemiological study. Did not clearly disclose that the reason for the reduced carbohydrates was likely to be due to self-help information. This made it appear to the health consumer that the lower carbohydrate intake could be causing their problems. This type of study cannot be used that way, but this would not be known to a health consumer. Recommended the consumption of whole grains which was an untested outcome. Again, for the health consumer who did not read and interpret the full paper, this would be misleading. The study made no reference to whole grains whatsoever. Did not disclose that the reduction in carbohydrates was significantly from a reduction in sugar. Sugar reduction is in line with WHO and Australian Dietary Guidelines, and the PCOS cohort was statistically closer to the WHO target. Did not disclose that neither the PCOS nor healthy women were complying with dietary guidelines or physical exercise recommendations. Made no comment on the relative good health of the PCOS women. Now the DAA might say that some of this were the author’s responsibility. However, I also note that they managed the peer review and accepted the quality of this paper for publication in their journal, so they also bear that responsibility. I cannot find a sound evidence-based reason why the DAA would produce such a press release from that paper. In the DAA example, I cannot say that this paper was influenced by the desire to ‘market’ whole grains for the food industry as Marika Sboros’ articles might suggest, but that is one possible reason. Many dietitians work in food manufacturing, and the commercial pressure to maximise profits for shareholders look to be at odds with the consultant dietitian’s advice that consumers need. How does one organisation properly reconcile these very different aims? I note that one of the corporate partners of the DAA is the Australian Breakfast Cereal Manufacturer’s Forum. They would have something to gain if more women eat wholegrain cereal for breakfast because they are fearful for their fertility. It would be scandalous if that were the aim of the DAA in producing this press release. Another possible explanation is that they are incompetent to interpret research and apply an evidence-based approach. If that is the case, it makes it hard to recommend seeing their members (APD dietitians) carte blanche as the DAA is responsible for monitoring their ongoing training and providing information. Another possible explanation is that they have dogma and dietary beliefs rather than science and have simply used this research to push pre-conceived dietary information on the public. That would also be quite scandalous if it were true. It could just be an advertisement to drive concerned women, trying to conceive, to see their APD members. The need to see their members indeed featured as a media message. It could be just due to very poor management of this organisation or even just one dumb mistake. The circumstances around this paper and press release, coupled with questions that Marika Sboros has raised about the DAA, also call into question the very peer review process of this paper and subsequent use of it as a consumer health message. I am not a nutrition scientist, but to me, it raises questions about the integrity of the DAA’s journal to be free of industry influence. It is one thing for the authors to declare conflicts of interest (and I do not suggest that the authors of this study have any undeclared conflicts); but what about the journal owner (the DAA) itself? It is speculation because we do not have all the facts, and I don’t think there is much point in speculating further. My comment section is, of course, open to the DAA, its staff, its dietitians or the public to comment. If you are a whistleblower or do not want your comment published, I will also respect that. If we can definitively answer this, I would be happy to update in this or a future post for the many health consumers out there that would be bewildered, like me, about this issue. Whatever the reasons and motivation, unfortunately, among the media to pick this up were the Huffington Post and News. You can see that if you read those articles, you would not find an alternate view. You might take the advice as those news outlets appear to have done no critical analysis of the DAA press release. Their many female readers may have taken this message to heart. It also appeared to generate social media activity and some women ‘tagged’ their friends to read this article. Did those friends have extra grainy bread or cereal after reading it? As a health consumer, I find this unsatisfactory. It does demonstrate how the media ends up reporting health advice that misleads the public. We can partially blame the media for this. They should have sought alternate views rather than taking a press release and just reporting it and only speaking to the DAA. However, the journalists apparently relied on the science in a press release from the DAA to be fair, evidence-based and accurate. The net effect of the press release is to give the exact opposite advice that they should have. If anything, the message should have been to reduce carbohydrates starting with sugar. The effect could be child-denying for a woman with PCOS trying to conceive and potentially life-threatening. It is horrific to me, and I am appalled that the DAA has not yet corrected this of their own volition. I call for this press release to be retracted and for better advice to be given. The DAA should also make efforts to contact every woman who may have read this press release. In fact, in my opinion, it is appropriate for any woman with PCOS who read this to be offered free dietetic sessions with the corrected advice lest it spawns a future class action. I note though that they tried to diminish Marika Sboros’ work by calling them blog posts and calling her a blogger when she has had a distinguished journalistic career spanning decades. They also make the point that she is not Australian based with the implication that it diminishes her journalism. That approach indicates both arrogance and a tendency to run on spin rather than facts. That behaviour is akin to the arrogance of Donald Trump’s handling of Whitehouse reporters. 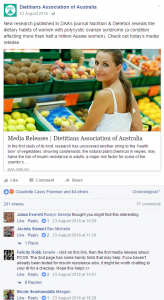 DAA, health consumers, deserve answers, not dietetic spin; but why would you listen to an Australian consumer health blogger like me? DAA management, if you feel you don’t owe health consumers a public explanation, how about coming clean to your dietitian members? After all, they pay most of your salary. Your training, advice and alleged intimidation of those with new ideas may be exposing them to lawsuits and liability. We can vote by not engaging your members’ services, and they can vote to sack you if your answer to them is unsatisfactory. Media Manipulation or Setting Journalism Standards? I note that the DAA gives out a cash and in-kind award for what it regards as good nutrition journalism. The award can be majority decided by the CEO, who presumably approved that PCOS press release, and their media manager who wrote it. Should the award be meaningful when its own press release standards appear to be so poor or if it has an agenda to push particular nutrition dogma rather than evidence-based science? If the journalists who won the award, wrote favourably of nutrition advice that marries with DAA sponsors or favours the DAA’s views, it could be seen as a cash incentive for having promoted its sponsors interests or dietary dogma. While it has sponsors of any kind, it seems a very ethically-sensitive undertaking for the DAA to be doing this. I think you need to make up your own mind about all of this. The bottom line is that, as health consumers, we need to be mindful that organisations can be influenced by many factors. Those factors can be other than for our health. My suggestion is that as health consumers we should boycott not-for-profit organisations that have industry sponsorship or donations. Otherwise, at least have very low regard for their advice. While the DAA looks to be quite poor about communicating evidence-based nutrition science, it would be unfair to say that all their members or dietitians are useless to give low-carb dietary advice. These are highly trained nutrition specialists. They know more about metabolism than we are likely to. If well trained and of an open mind, they should also be able to learn and grasp new concepts. They should interpret them rather than being mired in their organisation’s dogma or other interests. There is something we can learn from this if we are looking for help. There was some public outrage at the press release. Some people posted negative Facebook comments. Many of these people appeared to share an alternative view towards low carb. As an idea, perhaps you could try communicating with them to ‘health network’ for a solution. In my next post, we will look further at how we could perhaps find helpful dietitians and other advice.